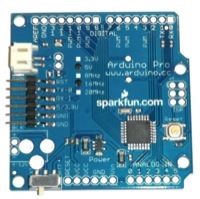 The Arduino Pro exists in 5v and 3.3V. As most of my components need 5V, I bought that version. As you can see on the picture below, the main difference is that the board is small because is has no USB connector, no 3.3V regulator (pay attention to this!!). In order to program the chip, you need that same USB2serial adapter as for the Arduino Ethernet. You may also notice that the chip itself is the SMD version, which again, is much smaller than the DIP.